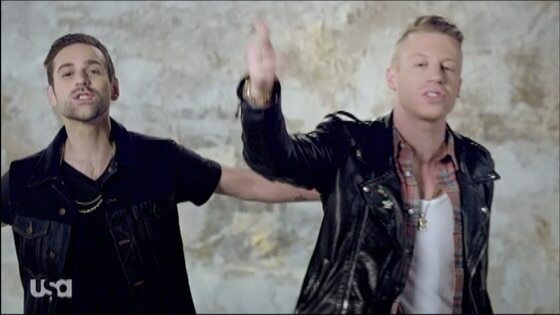 Macklemore and Ryan Lewis Team Up With USA for Anti-Bullying and Acceptance PSA—Watch Now! Macklemore and Ryan Lewis continue to promote love and acceptance. The Grammy-winning duo have teamed up with the USA network for a new anti-bullying PSA video for USA Characters Unite. The video is set to their moving song "Same Love." "We intended ‘Same Love' to help spread a message of love, tolerance and acceptance and we are proud to align ourselves with the Characters Unite movement which shares the same goal," Macklemore and Ryan Lewis tell E! News in an exclusive statement. "Through the new Characters Unite PSA, we hope to inspire even more people to take part in such an important cause." In the PSA, Macklemore says, "We have one life to live, so why hate each other? No law's gonna change us. We have to change us. Whatever god you believe in, we come from the same one. "The same fight that led people to walk-outs and sit-ins, it's human rights for everybody, there is no difference." Throughout the video, fans are shown wearing shirts that say they won't stand for religious intolerance, hate, sexism, unequal rights, harassment, bullying, homophobia, racism, violence and other injustices. "Join the movement and show what you won't stand for at charactersunite.org," he says. "I might now be the same, but that's not important. No freedom till we're equal. Damn right I support it." Watch the new PSA for yourself!